Discussion in 'Football Games (FIFA, FM, FPL, etc.)' started by al-Ustaadh, Sep 30, 2018. Just bought and downloading now. Gegenpressing feels pretty OP to me. Won Bundesliga with Hoffenheim and La Liga with Valencia first seasons just using the base gegenpressing tactic. I hope it doesn't end up being like 3 striker tactics in FM18. BobP, Carlo Marx, Keplaz and 1 other person like this. Been getting some negative reviews. The new training system overhaul has been hit and miss. Had an amazing season with Pescara in Serie A.
I was promoted after finishing 1st in Serie B with 95 points, scoring 86 goals and conceding 38. Fiamozzi was a joke, notched up 16 assists from RB. The 19 year Capone was my top scorer with 20 goals from the left wing. The problem however was that I didn't own some of my best performers. And the fact that they had performed so well made it near impossible to purchase them for a reasonable price. Additionally, depending on which club they were owned by I couldn't loan them back because they thought they were ready for 1st team action. Because of that I was unable to retain the likes of Fiamozzi and Cappelluzzo, who had scored 15 goals for me. I was fortunate enough however to secure both Capone and Del Sole on 2 year loans. Valzania's loan agreement also had a very low optional future fee, which I of course exercised. I also bought an attacker by the name of Michael Fabbro, who played for Bassano in Serie C, for 250K. However, he was going to join at the end of my first season in Serie A. Basically, my transfer activity consisted of scouring the lower leagues, and bringing in a bunch of discards who were deemed not good enough to play at the highest level. During preseason, the guy who I was planing to use as my main striker, Stefano Pettinari, threw a strop because I refused I give him a new contract. A. I was skint and B. he'd been outperformed the season before by a young kid, he didn't deserve a raise. I ended up selling him for 250K, way less than what he was worth, to Livorno, where he stunk the place up, only managing to score 6 goals in 38 appearances in Serie B. He's now been transfer listed by Livorno. Problem was that I had no money to buy a replacement and had two strikers in Padovan, who Juventus basically gave away, and Bunino, who was my 3rd choice striker from the season before. I ended up having to play Padovan as my striker, a 24 year old journeyman who had never managed to score more than 5 goals in season in the lower leagues of Italy. Things weren't looking great. We ended up finishing 9th on 58 points, with 18 wins, 4 draws, and 16 losses. We scored 85 goals, but conceded 74 . My front 3, aka the holy trinity, scored close to 60 goals between them. My boy Capone notched up 24 goals from the left wing, and former Serie C journeyman Padovan scored 19 goals in his debut Serie A season. Del Sole scored 15 goals. 5-3 loss VS Napoli. We were 3-0 up within the first 25 minutes of this match and were 3-1 to the good at half time. 3 of my players got sent off in what was a farcical end to the match. 3-2 win VS Inter Milan. 4-3 win VS Chievo. Crucial win after 3 consecutive losses. Benali scored the winner in the 92nd minute. 5-1 win VS Napoli. Revenge. We were also named Serie A's best club of the year. Carlo Marx, luigicalzone and krackpot like this. **** Serie A and their lame head-to-head rule. American_Gooner, Gooner416, Godwin1 and 1 other person like this. Bought De Jong, De Ligt and Sterling. Sold Mustafi, Elneny, Welbeck and Mhkitaryan. Changed Willcok to -85 Potential, Nketiah to -95, Smith-Rowe to -9 and created Yunus Musah with -95 potential. I'm not competing against anyone or in any internet challenge competitions. Just playing for my self and having fun with the in game editor. krackpot and Keplaz like this. I'm a firm believer in playing any game in the way that brings you the most enjoyment. If you're playing the computer, everything goes. Hadn't bought FM for years until I heard they came up with the in-game editor. These games are just horrible without it. It's always had one just you have to pay for it now. I think there has been editor as early as the first game. But in-game editor is something that came later. I love the in-game editor. Allows me to alter the game in terms of my reality. For example I put Mustafi decisions making to zero and sell him to United. Lovely stuff! What's happening now? I like reading about FM careers. I also like the Italian leagues. I managed Bassano for 8 seasons in FM18. Eventually won Serie A and Champions League, great fun. And I find myself inexplicably fond of a town I'll never ever visit. krackpot and BobP like this. that's the romance of FM. Still don't know what Torquay is, but I would like to visit it someday. I played with them for almost 5 real life years. Wow! That's mental! How many seasons was that? The most I've played is one year with the same team. That was Derby County in FM07. Loved that team. For some reason I can never use Arsenal. I always try but just can't do it. It feels too personal. They head hunted me when I was Crystal Palace manager in FM18 but couldn't bring myself to take the job. Job went to Roberto Mancini and he nearly won the league. 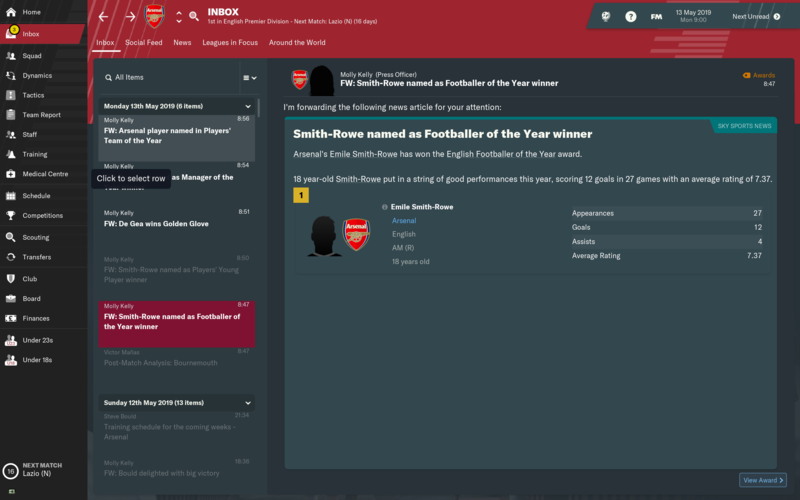 I used to also never take up Arsenal, but I generally try to move my way up, and try to manage AFC after about 20-30 in-game years. AFC was quite overpowered in FM, and Wenger would never leave, so I used to have to wait until he retired, and then hope the next manager was ****. Derby was a great team. I managed them quite a lot during those times. I didn't play Torquay for five straight years, but always used to pick them around 2010 or so. They had a very small starting squad (about 17 players), and loved to jump in, and get in some of my own players. I deleted the save unfortunately. Things were never the same after Capone went back to Atalanta with his two year loan having come to an end. The final straw was him scoring a hat-trick against me, it was all too much to bear. From memory, the team was as follows. Ran a save with Bayer Leverkusen on FM 19 and delegated most of my responsibilities to the DoF Jonas Boldt. This chap had the temerity to offer a scouting position to a WOMAN, namely Helena Costa, the lady who was manager of Clermont Foot for a minute. I overrode him, withdrew the contract offer, and sacked him on the spot. American_Gooner and Dennis_Bergkamp_10 like this. Found out recently that Jonas Boldt was implicated in the whole football leaks and is now longer the DoF at Leverkusen. Saw that coming from a mile off, quite clear that he wasn't of sound mind, considering that he was willing to hire a woman as a scout.